Almost all people need some kind of human connection and interaction. In fact lack of human contact can lead to mental health issues. Some would say that even negative human contact is better than no contact. Some people find it really easy to make healthy and constructive friendships with others. They have a variety of connections ranging from acquaintances they meet day-to-day, good positive work relationships and deep and meaningful relationships. Other people have a wide variety of relationships but for one reason or another their deep and meaningful connections and friendships continually don’t work out or breakdown. And a few people never get deep and meaningful friendships and relationships and yearn for this, continually feeling lonely. So why is it that some people find making healthy people connections easy, whilst others find it difficult, despite trying? To help demystify how relationships develop it is useful to consider the 5 levels of communication, adapted from Berne’s “What do you say after saying hello” book from the 1970’s. These 5 levels of communication are shown below. Most of us are wired to not want to get hurt emotionally and we like to protect ourselves from the risk of getting hurt. So we instinctively communicate on different levels in an attempt to build up emotional security and trust. We instinctively want to have deep and meaningful connections. Let’s look at the Five Levels in more detail. A minority of people are just not “people” people or are not wanting to speak to people that day and will “Avoid” talking to a person, acknowledge the person or even look at a person. It is difficult to go through life avoiding human contact though so usually when we meet people day-to-day there is a need to speak. This is called Ritual communication. So we may smile and acknowledge the person and may even say hello. Every day we may end up having many ritual connections. Ritual communication is low risk because it is unlikely to hurt us but equally it also doesn’t build up deep and meaningful connections. It’s all very superficial. If we see a “Ritual contact” often, say the same person making our coffee daily we may end up exchanging more than Rituals. If we end up waiting for a train which is delayed then we may end up “Chatting” to a person just because staying silent is more awkward. This “small talk” tends to be not too detailed or personal. We might exchange names, what we are doing that day, where are we going and of course the weather. Hairdressers are notoriously good at this…talking about the weather, going on holiday, what are you doing after the hairdressers, what do you do for work etc. This is like advanced “ritual” conversation, again quite safe and also superficial. 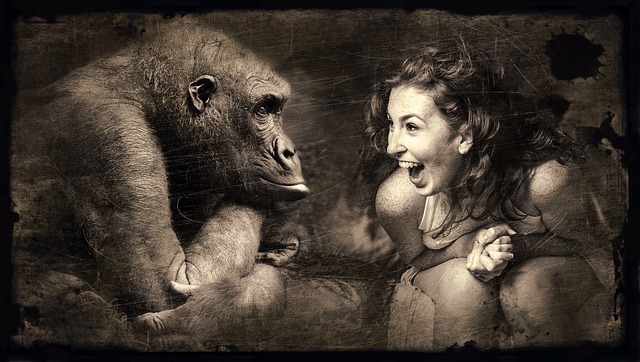 For most of us during a day we will have a range of connections and conversations which are either Avoidance, Ritual or Chat….all low risk although the Level 3 Chat stage can be an important part of building up trust and rapport which may develop further. Level 4 Communication is deeper and is more risky. These are Practical Conversations which tend to be about information sharing. This is frequently seen in a work setting, during meetings, on projects and through reporting. Clearly at work there is usually more interaction. As an employee there is usually more of a requirement to give information and contribute to the team. Trust is built between team members and people do get to know one another. It is no surprise that many life relationships often start at work. Also level 4 conversations occur on dates, coffee mornings and between people pursuing hobbies and interests. This is normally after the settling in period during which Ritual and Chat conversation have taken place. If successful then the ground work for Level 5 Communication is created – many relationships don’t progress beyond Level 4 but when they do then these Feelings Conversations are about you the person and how you feel. So these are the relationships which are often seen in families, deep friendships, marriages and similar relationships. In these relationships individuals are likely to have similar core values, moral codes and beliefs. There is synergy. This doesn’t mean the people have similar personalities, more that their inner values are similar. In these relationships people feel they can be themselves and are loved for their strengths whilst their weaknesses are seen as allowable weaknesses. There is high trust, high rapport and the risks of showing feelings and being rejected or hurt is low. In terms of quality of connection Level 5 communication are seen as being high quality in comparison to Ritual and Chat communication. 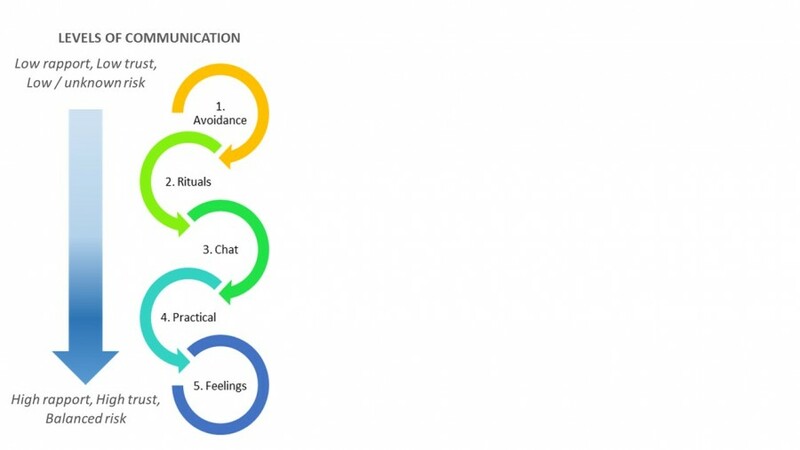 In terms of quantity of connection then Level 5 communication is likely to be far less whilst Ritual and Chat communication is likely to be much higher. Communication is often described as a “dance” between two people as there is lots of movement between the different levels. This is because people don’t often build trust and rapport at the same speed and adding in the risk factor complicates the relationship. We do have a natural pull to have Level 5 Communication but this is all down to trust, rapport and how emotionally safe we feel. At Level 4 rapport is growing and developing and people will move, or dip their toe in the water of Level 5. Here people are testing each other, more often than not subconsciously. This is sometimes referred to as “Playing Games”. These games can be fun, useful, challenging and emotional. People can dance or move between these two levels before deciding which level the relationship is in. This is the same for all the levels. People can move up and down the levels in one conversation or for many years. Some social situations can quicken the journey to level 4/5 but equally the movement back to Level 1 can be even more rapid! 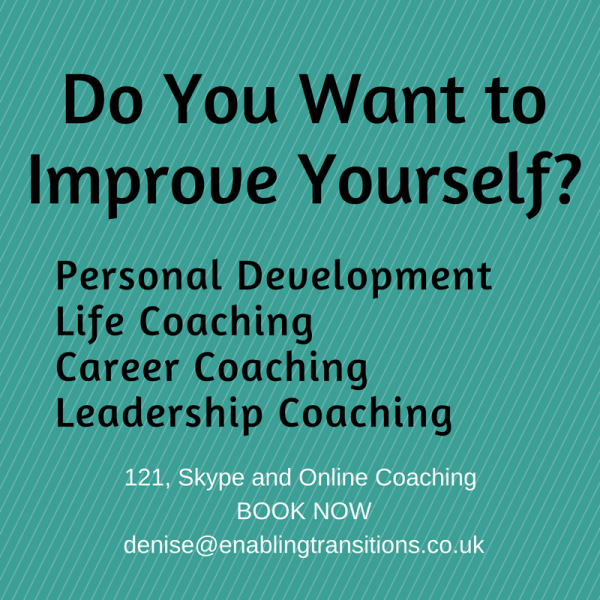 If you want to improve your relationships and connections with people then coaching will help. Print article This entry was posted by Denise on April 26, 2018 at 6:27 pm, and is filed under Personal Development. Follow any responses to this post through RSS 2.0. Both comments and pings are currently closed.